What can you do to improve your home brew? Use these great tips for better home brew. Just like the ones that Brewmasters, Sam Calagione, Dale Katechis, Jim Koch, Jeff Lebesch, and hundreds of others have used. They used tips for better home brew and so can you! Their background as home brewers propelled them to become – Brewmasters. Always prepare ahead for brew day. Pro brewers take care to insure that all their ingredients and equipment are “in stock”, or on hand, before starting the brewing process. Sanitize all the equipment before starting to brew. Sanitary conditions are essential for successful brewing. Bacteria and wild yeast can and probably will invade your beer otherwise. The rule of sanitization is a brewer’s best one! Take the time — clean and sanitize. You’ll relax and enjoy your effort later with each great brew. Pre-measure all ingredients as your brew water heats. Lay out,or have nearby, all equipment needed for brewing. The technique is called “Mise en Place”, (put in place). Chefs use it to smooth the cooking process. This one tip will make brew day so much more fun! “Extracts” are the fermentable sugars that come from malted grains. Available in either dry or liquid form. “Steeping grains” are grains that do not need to be mashed. They are steeped like tea. “Mashing” is the process of cooking the grains in water and allowing their enzymes to convert their carbohydrates into fermentable sugars. 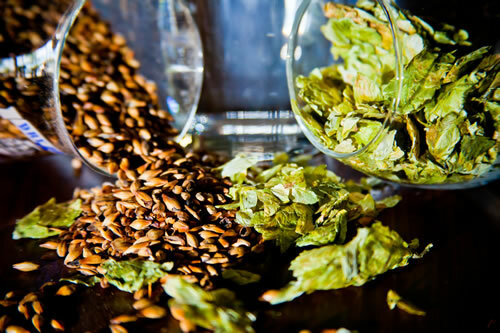 “Wort” is the water, grains, malt, and hops that have been boiled. It is your unfermented beer. Make a yeast starter* 24 to 48 hours before brew day. Tubes and packs of liquid yeast come in many varieties and are high quality. However, the yeast count is considered by many knowledgeable brewers to be too low to properly ferment a 5 gallon batch. Using DME (dry malt extract) and distilled water, plus yeast nutrient, it’s easy to quickly prepare a starter*, and to insure that the yeast is at both an optimum count, and at their peak health. Hey – they have a big hill to run-up soon – your wort! Print out your recipe or have one with your ingredients. It should include step-by-step instructions, including boil & hop schedule. Hang it in an easy to read place – close to your brew kettle. Use a good kitchen timer for the boil schedule. Gram Scales are essential for consistent batching. Digital scales that weigh to .1 gram are inexpensive. When used, accurate hop and grain weights are assured, so your batches are controlled. Pro brewers are consistent – you can be, too. If just starting out and you are using even ounce amounts – put off getting a scale until needed. Use “Extract with Steeping Grain”, or even better, “All-Grain” for the best, freshest flavor, and for more control over your beer flavor and color. 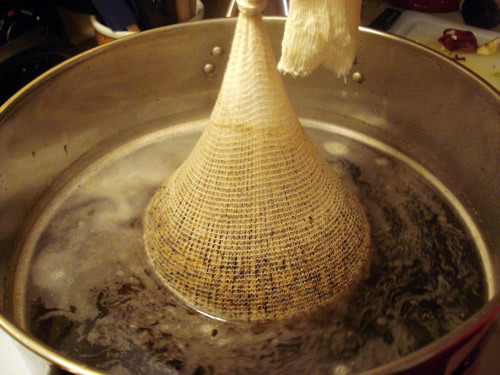 Tips for Better Home Brew Steeping Grains at work – like a gigantic tea bag! By using the Extract with Steeping Grain rather than the prepared extract alone, your brew will be much more flavorful. Steeping grains can also add body to the brew and enhace the color. Steeping Grains do not need to be mashed – just “steeped” – like tea. The All-Grain method is basically doing everything from scratch. It requires extra steps, including mashing, and using more equipment. It takes more effort and time, but is worth it for the extra flavor and control. Know your grains and hops well. By smelling each variety of hops as you brew with it, you can develop an idea of how it affects the flavor or aroma of beer. Taste a few kernels of barley or specialty grain and see how each one tastes. Taste the bitterness of Black Patent malt and the sweetness of Caramel malt. What does brown or chocolate malt taste like? Learn one at a time and build your palate of flavors. Take note of their color, too. The colors of malts are coded using “Degrees Lovibond” or “SRM ratings” (Standard Reference Method). Barley will have a unique taste depending on how hot and long it’s cooked. Wheat, rye and others will have their own flavor. Look at the water. It’s the largest quantity of the ingredients used in beer making. Don’t overlook this important, but common one. Chlorine in tap water will be removed when boiled or charcoal filtered. When faced with hard water, or highly chlorinated water, you have a choice; filter it or accept the possible flavor distortion. Do what the pros do – use a water filter. Distilled water may be used, but some minerals are needed for the enzymes to break down the starches into soluble malt sugar. Add inexpensive yeast nutrients to your water and give yeast a boost for fermentation. I use Wyeast Labs’ proprietary blend of vitamins, minerals, amino acids, nitrogen compounds, zinc, and trace elements – 1/2 teaspoon per 5 gallons. Give your yeast some air – a lot of air. Yeast must have oxygen to grow. Their growth is what causes fermentation and gives the necessary byproducts of CO2 and alcohol. Studies have shown that the more O2 that yeast have available for growth, the faster and healthier their growth will be. Eliminate oxygen from your beer. There is a time that oxygen is needed, but at the wrong time – it’s a brew “killer.” Allowing oxygen into fermented beer causes oxygenation – a fancy way of saying that your beer will taste awful. Always be sure that there are no air bubbles that are created when transferring wort (racking) from one container to another. Staling is guaranteed when oxygen enters your brew after the fermentation stage. There are ways of creating a “closed brewing system” that eliminate not only O2, but also keeps mold and wild yeast out of the brew cycle. In a later article we’ll examine this system. “Tips for Better Home Brew” in twelve easy steps is just one of many useful and informative articles in Black Bucket Brew Magazine. Subscribe Now for your free emailed eZine!